The 2017 edition of Middle Of The Map Fest concluded on Saturday with an all-out, all-day hip-hop extravaganza. Eight One Sixty and Shuttlecock joined forces to host a local hip-hop show at The Tank Room. The venue had been stripped of furnishings for the impending change in ownership, but was filled with immense artistry and appreciative crowds throughout the afternoon and early evening. Sets at the day show ranged from DEV3N's near-avant-garde performance art, to Aaron Alexander's most energetic show yet, to the raw power of Ebony Tusks. Each act brought something different and interesting to the stage and illustrated each and every thing that makes Kansas City hip-hop incredible. We would like to thank festival organizer Chris Haghirian, everyone volunteering and working at the venue, and every performer -- Sahvannes, DEV3N, Aaron Alexander, Domineko, Dom Chronicles, Heartfelt Anarchy, Kemet The Phantom, and Ebony Tusks -- for making this show as amazing and fun as it was. Within an hour of the day show's end, things got rolling at CrossroadsKC down the street. Dom Chronicles performed for the second time on Saturday as a part of an Indyground Crew set. 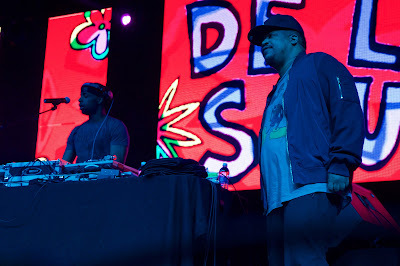 Joined by Steddy P, J-Bomb, Farout, Scotty Wu, and their trusty DJ Mahf, Chronicles and the gang performed a well-executed set that exhibited the technical abilities and distinct personalities of each member involved. Following Indyground was Topeka emcee Stik Figa. Figa -- and his DJ for the evening, Conductor Williams -- both made their second appearances for the day as well. Figa is a rapper who could rap the phone book and entertain for hours, so, needless to say, performances of tracks from his latest album thrilled every fan of golden era hip-hop who happened to be standing out on the wood chips. The first touring hip-hop act of the day came from Ro Ransom. The New York rapper-singer stuck out compared to the rest of the evening's lineup. Ransom flaunted Uzi-style shoulder shrugging, eye rolling dance moves while decked out in a Hardy Boyz tee, shiny pants, and eyeliner. These characteristics likely made him an instant no-go for many hip-hop purists in the crowd, but his half hour set of well-crafted modern pop rap and vocal appreciation of the acts following him hopefully won him some love. If any touring act at the fest is about to have an enormous year, it's Ro Ransom. The second of the three New York hip-hop acts of the evening was from Talib Kweli. Kweli and Hi-Tek used his set as an informal hip-hop history lesson, schooling fans on the genre's classics and its melding of influences from the genres of rock-n-roll, jazz, and reggae. The after school programming included several solo hits and at least one Black Star track from his days with Mos Def. The night's ultimate performance came from New York Native Tongues members De La Soul. An audible wave of disappointment rippled through the audience as it was announced that Maseo -- one third of the group -- was unable to make it to the show. Despite this, a majority of the crowd of 2,000 seemed to forgive the group without haste as they jumped into a whirlwind performance of electric and grooving nineties hip-hop. Throughout the hourlong set, Dave and Pos worked the crowd into a frenzy like few others can. The pair made a "this side/that side" routine as entertaining as possible, whipped out classic "3 Feet High And Rising" tunes, and had even senior citizens in attendance dancing the whole time. There could not have possibly been a better way to end three long days of one of Kansas City's favorite festivals.